Like many of us, Buddy the teddy bear has dreams of belonging to a loving family and traveling to faraway lands. From the lonely top shelf of a toy store, to the inside of a box, to the inside of an airplane, finally the box opens and Buddy can see light again. Buddy the Soldier Bear has seen and done quite a bit; he’s flown in helicopters, parachuted from planes, gone on long trips, and seen some things he’d rather not see. Travel along as Buddy becomes part of a loving military family and shares in their experiences. And watch as Buddy’s dreams come true. Author Marie Joy takes on an adventure with a bear that accompanies a soldier on duty in another country. The Stencil font on the front cover was an excellent choice for a book about a soldier bear. The illustrations by Brandon Pollard are very well done and clearly demonstrate the scene and set the mood for the book. Their rich, dramatic tones place us in the adventure. Buddy the Soldier Bear is an easy-to-read book, which many families can relate to. Parents and children will enjoy reading about the exciting trip of Buddy and his military friends. Author Marie Joy has written a wonderful, imaginative story about a bear that has dreams and achieves them. 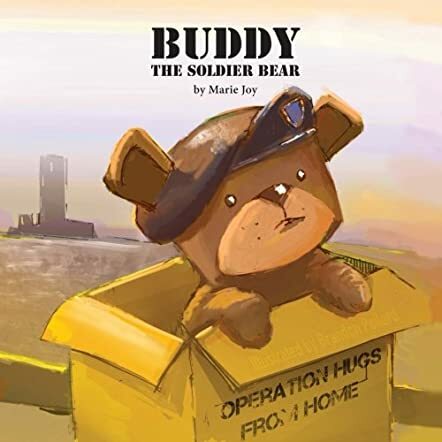 Buddy the Soldier Bear is a feel-good story with a happy ending. If you were traveling, which toy would you take and what would it see?